Due to an undisclosed injury to Mike Ciesnolevicz, The Ultimate Fighter 8 light heavyweight finalist Vinny Magalhaes has magically appeared to take on his former castmate Eliot Marshall at UFC 97. MMAWeekly.com confirmed with sources close to the situation that both fighters have agreed to the bout, and the UFC should have bout agreements in hand shortly. Ryan Bader TKO’d Magalhaes in the 1stRound of their The Ultimate Fighter 8 Finale matchup, taking away the highly coveted six-figure UFC contract from the Brazilian Jiu Jitsu genius. Marshall caught Jules Bruchez with a rear-naked choke in the 1stRound that same evening. 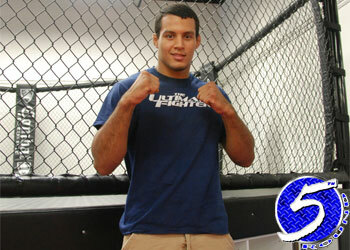 Despite Magalhaes’ participation, the bout will remain on the un-televised portion of the April 18th pay-per-view event.